So.La is a curatorial adventure, an exploration into the depths of incarnate experience. Structured in three parts, the adventure takes on the mediums of dance, theater and curating. Each medium is explored in fifteen minute pieces and though each addresses unique issues they are all conceived as building blocks for the whole and can be interchangeably arranged: The dance piece, entitled „solo“ is driven by the somatic experience of suffering, surrender and stillness in the face of a rising and falling struggle with disease. „en route“ is a choreographed monologue that appropriates the strategies of magic to touch upon the subject of the agency of things, object-oriented philosophy, speculative realism, and the fictitious construction and narration of the Self. Finally, „curatorial instrospectionism“ is a participatory experiment inspired by the Würzburg School’s investigations of imageless thought processes, the Gestalt’s organismic theory (in particular Adriana Schnake’s technique of dialoguing with one’s organs), Embodied Mind Philosophy, and finally the Anthroposophic approach to cognition of the spiritual world. Camila Marambio is a private investigator and independent curator. With an MA in Modern Art: Critical and Curatorial Studies from Columbia University and a BA in Aesthetics from Universidad Cátolica, Chile, Camila attended the Curatorial Programme at de Appel arts centre, Amsterdam in 2006/2007. Later, she founded and coordinated Proyecto Piloto, an alternative education program in the city of Valparaiso and from 2008-2010 she was curator of the Visual Arts Department of the cultural center Matucana 100 in Santiago, Chile. In 2010 she was curator in residence at Kadist Art Foundaton in Paris, city were she also initiated her studies in Political Science. 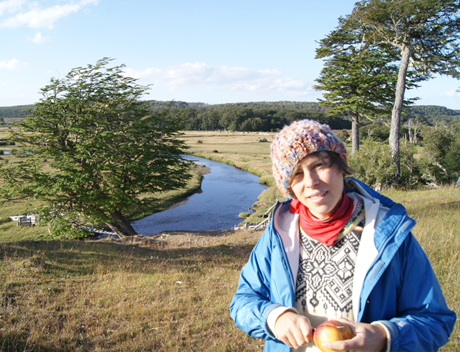 Currently, she directs the research residency program Ensayos -based at WCS Karukinka Park in the Chilean Patagonia- through which artists, scientists, and local inhabitants contemplate and engage in issues relevant to Ecology.